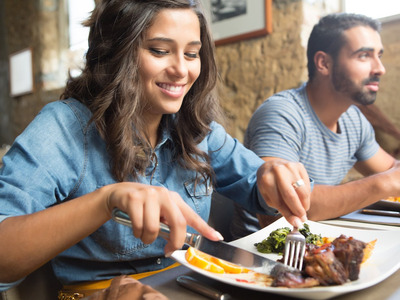 Joana Lopes/ShutterstockZurich, Switzerland, was found to have the most expensive dinners in the world among the cities analysed by Deutsche Bank. A basic pub dinner for two will run you more than $US72 in Zurich. Want to save money on meals while you’re travelling abroad? 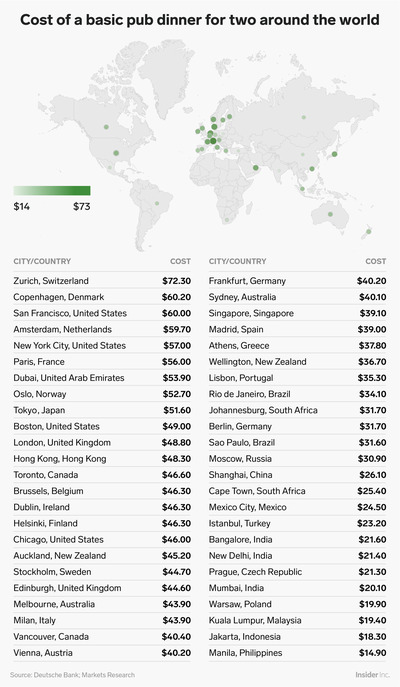 Deutsche Bank compared 50 world cities as part of its annual “Mapping the World’s Prices” series, and found that in Zurich, a basic pub dinner for two will run you $US72.30 on average. In the next two costliest cities, Copenhagen, Denmark, and San Francisco, a basic dinner for two will run you about $US60. Most of the top cities on the list are in Western Europe and the United States. Meanwhile, the cheapest cities that Deutsche Bank analysed all are in Southeast Asia. Manila, the capital of the Philippines, had the cheapest dinners on the list, with a meal for two costing just under $US15.